Conversion from a Nissan 2 stage variable camshaft timing system to a fully variable system from a Mazda BP6D engine (page 4). The exhaust camshafts have the same lift and duration as the intake’s, and were set at a centerline radius of 106°. Using 260° as the reference value, this means the exhaust valves open 56° BBDC and close 24° ATDC. Tomei actually recommends a centerline of 115° which means the exhaust cam setting on my engine adds 9° additional overlap. Since the engine ran very well at this cam setting, I decided not to advance it back to the Tomei spec. At the test stage the engine will see low boost pressure, when increased later the exhaust cam may require additional advance to reduce overlap. A short specification of the test engine; VG30DET engine with forged JE pistons and Eagle connection rods, a custom lightweight crank pulley and twin plate carbon-ceramic clutch. The heads have modified inlet ports, a custom intake manifold with individual throttle bodies and high flow tubular exhaust manifolds. Two 3″ exhaust downpipes with race catalyst merge into a single high performance 4″ exhaust. The turbo’s are Borg Warner K16 with Garrett GT2860RS compressor wheels, and run large actuators without pressure regulation (this would have to be setup on the dyno which would require lot’s of runs for which was no time). The factory engine management is equipped with a custom chip written to a rather safe profile for 660cc injectors, a single factory airflowmeter is used. The factory lambda sensors were disconnected since the higher overlap values may allow large amounts of unburned mixture to enter the exhaust. The custom chip enables running with disconnected lambda sensors. The best way to test the VVT system is to use flat maps with just 1 angle setting over the entire rev range. Doing so, the test results from each setting can be overlayed to find the best settings. Mappings used are -5° (solenoids simply disconnected), 1°, 11°, 22°, 33°, and 44°. This results in a valve overlap values of 19°, 25°, 35°, 46°, 57° and 68°. When a final mapping with variable angles is created, the PID values also have to be adjusted. The PID settings control the speed, response and brake time of the solenoid. Sinceit requires an ‘active’ map with varying angle settings I decided to leave these settings alone for this test. The car was brought to the Dynojet facility at Moritz Tuning Amsterdam. I’ve used this dyno before and it’s generally considered to be reliable. A downside to this dyno is that the rpm measuring system interferes with the Nissan ignition signal, so the runs were performed based on speed, and later calculated back to rpm. I had never run this engine on a load so it was difficult to predict how it was going to behave. The car ran a little rough the first 2 runs. The engine would idle extremely lean and sometimes stall. There were several causes, the neutral switch on the gearbox was not active and the factory recirculation valves were not installed. The issue fortunately resolved itself and I was able to achieve useable results for all VVT angles and also tested the variable valve I designed for the intake manifold. Intake pressure was very low so the engine peaked at 278hp @ wheels, though it should be capable of more than twice that when fully setup. I made several video’s that recorded various data (such as pressure vs rpm) but they were all lost due a malfunctioning GoPro camera. 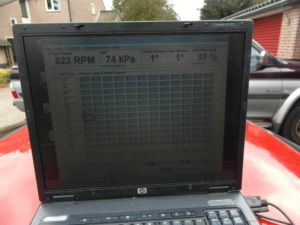 The dyno operator was hesitant to pull the engine into the rev limiter so most of the runs were done to about 190 km/h. Given the gear ratio 210km/h would equal 7000rpm, I have data up to around 6400rpm. He felt the prop shaft was not well balanced which held him back a bit. There was too much wheelspin to use 3rd gear. Still, the data is well useable. The runs were all performed with the variable manifold closed, thus the engine breaths like 2 seperate 3 cylinders. Air-fuel ratios were in the low 11’s from about 4000rpm when the pedal was floored. Noticable is that all settings apart from the 44° show the engine climbing in power until the cut-off point. I would expect the 33° and possible -5° to drop off later as well. Considering the large amount of valve overlap this is a testament to the low boost pressure and potential of the engine. Noticeable is the large difference in power from the start on. I think this is related to temperature (the recorded temperatures on the dyno exceeded 40° C during some runs) and wheelspin, and does not fully reflect the mapping’s performances. The 2 most extreme maps, -5° and 44° were the worst performers. The -5° keeps the engine in a constant Atkinson cycle pumping air back out of the cylinder, while the extreme valve overlap @ 44° blows the intake charge out and delutes the incoming mixture. Typically though, the 44° makes an aggressive climb for power at 115 km/h (3800 rpm). A similar climb can be seen from the 33° map, it builds slower but holds much stronger on. However, when the 33° graph approaches it cut-off point (191km/h, 6400rpm), power barely increases. I suspect it to start dropping before 7000rpm. With a higher back pressure once the boost would be increased, this effect would become even worse. The 1° map also runs the engine largely as an Atkinson. The graph is not powerful but linear and would likely progress that way up to 9000rpm if the engine could do that. Strangely, on this map the engine did perform well in the lower rpm range, a range I had expected the 33° and 44° maps to perform best. The 11° map is also outperformed by the 1° map up to 125 km/h (4150 rpm) but from there the 11° takes over strongly. The 22° is overall the best and only slightly outperformed by other maps.